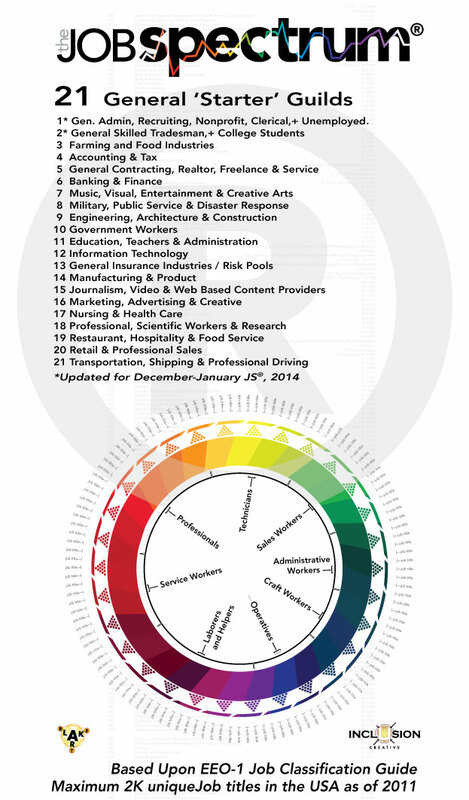 Thank you for being a Participant in the second functional JobSpectrum™ survey. This collection of ‘Manufacturing Data – With Meaning™’ is the first step of building the Mechanism that will drive the Spectrum’s functionality. And this cannot be done without all of us participating, together – this is an un-exportable or outsourcing endeavor. This is a Shared-Workload, Shared-Revenue model that can be applied to a wide variety of ways — analyzing Jobs is just one way this Patent-Pending Mechanism works. You participating in this ‘Job of the Future™’ is essential to the formulation of this brand new Mechanism that is theJobSpectrum™. Why is this a ‘Job of the Future™?’ theJobSpectrum™ is an attempt to get out in front of an issue that is building in the western civilizations – redefining what we think of as ‘work’ or ‘labor’… filling out this survey is a way to not only produce this new work, but to actually engage the populous in a monthly diagnosis of how we feel about the different jobs we all do, enabling us to Assign Value to Guilds that are difficult or to this point impossible to do – it gives us flexibility, purpose and knowledge about the different jobs we all do. There are a scattering ‘Ads’ throughout the Survey to show how this ‘New Medium’ will work. Because this is so different from anything that presently exists, you will need to see it in action so you can absorb the technique for how this Mechanism makes sense, but has the Potential to Generate Revenue. But for every Dummy Ad you see, know as you take the survey that YOU will receive a sizable percentage of the Media Buy that the Advertisers Spend to display that ad for you to view. This is the only Media Platform that YOU as a participant benefit from financially. Read the following list of ‘Starter Guilds,’ to your right –> and pick which one most closely aligns with your own personal Job, Employment or Situation. You can rank your own Guild, however those answers will not be included in the monthly scoring. 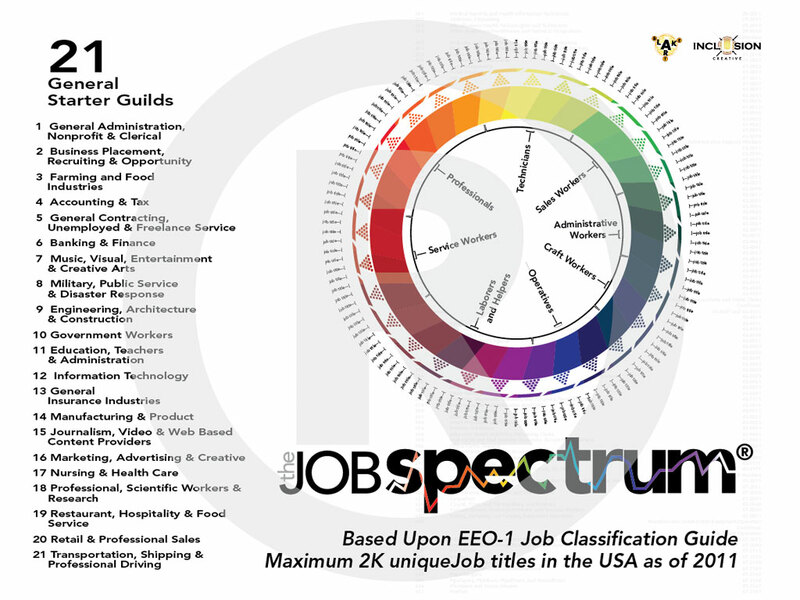 In the later incarnations of theJobSpectrum™, you will not be able to rank the Guild to which you belong – the point of theJobSpectrum™ is to get your perspectives on all the Other Jobs that presently exist, besides your own. This eliminates bias in the data collection. You will be asked to supply additional information on the form, so please take the time to fill out the form completely. Remember, this is an Opinion Survey. There are no right or wrong answers — you are Assigning Value which is captured for analysis at this particular moment in time. So let the needs of society, as you see them, pepper your answers as you see fit. We are Measuring something that, up to this point in time, was unable to be measured. The beauty of Participating is that you can insert Seasonal, Personal, Topical, Trendy or even ‘Emergency-Influenced’ Opinions into your answers. This is important – it is how you feel about the different types of Jobs and Professions that exist at this moment in time that one of the many key factors of how theJobSpectrum™ operates, so don’t be afraid to be completely honest. This data can and will be used to reinforce how we prioritize what we are doing as a society, and to also assign greater value and meaning to the jobs we perform. This has been very difficult or impossible to do with the tools society has had available—up to now. Thank you again for your interest—enjoy the Survey. It looks daunting at first, but once you start answering the questions, you’ll get the hang of it, and it really does go quite fast. It becomes relatively easy and takes a short amount of time – about a minute per Guild Category – so roughly 20 minutes. Do it in your spare time—it should work on your smartphone or tablet. Try to do it all in one sitting, because you can’t stop and come back to it later, unless if you can keep your tab open for a long duration. So don’t be intimidated by the amount of questions—you’ll get used to the Self-Similarity (the repeating pattern of the same 3 questions to the changing variables of the different Guilds you will be ranking) in no time.